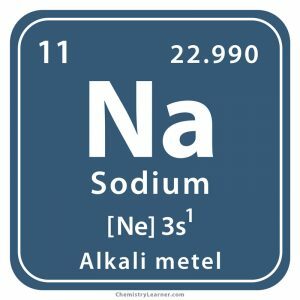 Sodium (pronunciation SO-dee-em ), represented by the chemical symbol or formula Na , is a soft, malleable element belonging to the family of alkali metals . Naturally occurring Na is its most stable isotope with mass number 23 [1, 3]. Besides that, it has 16 synthetic, radioactive isotopes with known half-lives . When burnt in air (oxygen), it forms white sodium peroxide and sodium oxide. Sodium reacts rapidly with water to produce a colorless solution of sodium hydroxide (a base) and hydrogen gas. During the exothermic reaction, the metal may become so hot that it may catch fire and burn with an orange-colored flame. It reacts vigorously with all the halogens (chlorine, fluorine, etc.) forming sodium halides. It dissolves readily in dilute sulphuric acid. If a small piece of Na is dropped into ethanol, it reacts steadily releasing bubbles of hydrogen gas leaving behind a colorless solution of sodium ethoxide [4, 5]. Sodium makes up about 2.6% of the earth’s crust and is the sixth most common element on the planet. 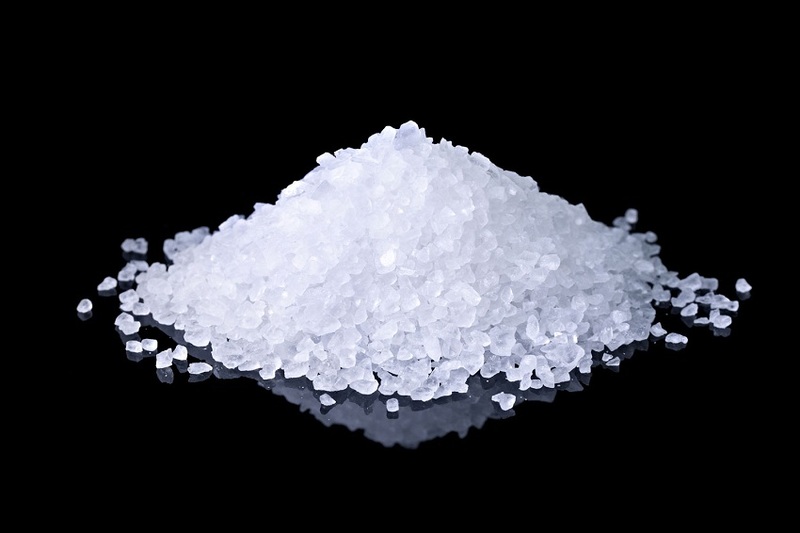 Its most common compound, sodium chloride, is a very soluble salt and has been leached into seas and oceans from the time the earth came into existence. Many such salt beds have been found where ancient seas had evaporated. 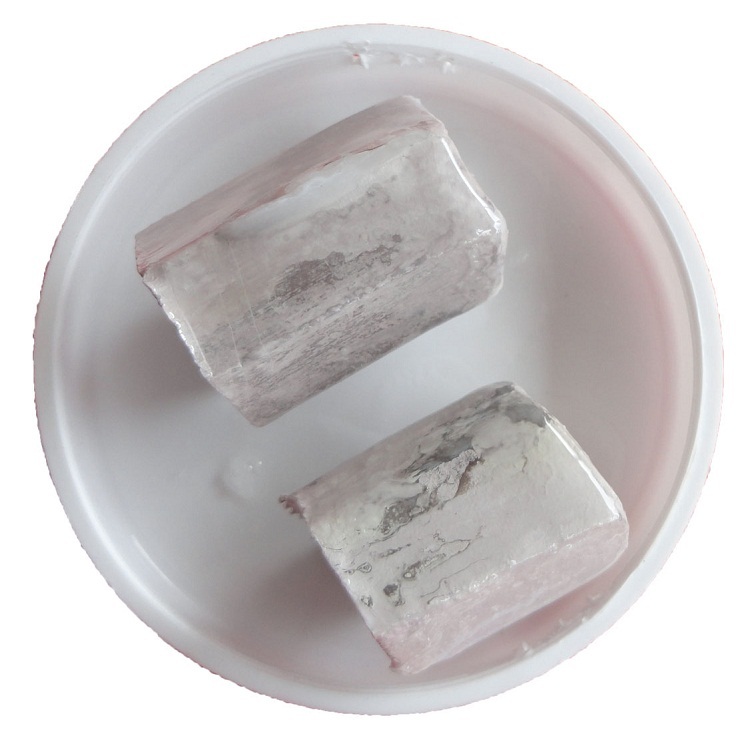 It also has sources in many minerals such as zeolite, cryolite and sodalite. 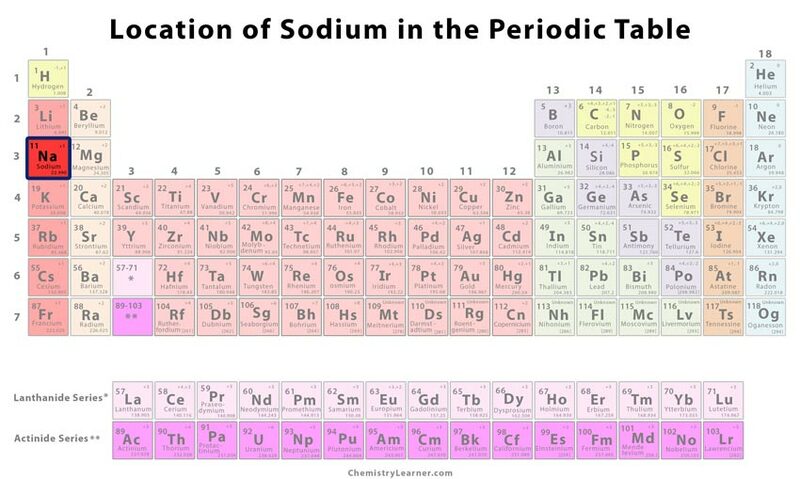 Being a very reactive element, it is hard to find sodium in its uncombined state in nature. It can be produced by the electrolysis of dry, molten sodium chloride . Origin of Its Name: Its name is derived from the English word “soda” and Medieval Latin word “sodanum” meaning headache remedy. 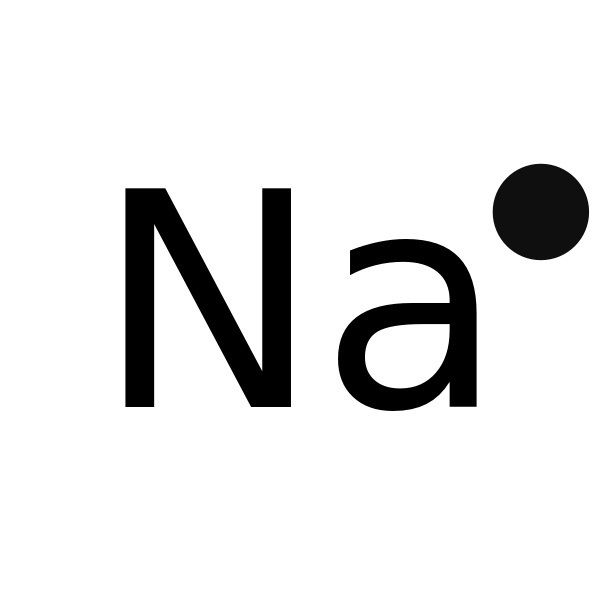 The Latin word for sodium carbonate, “natrium” is the origin of its chemical symbol [1, 2]. Who Discovered Sodium: British chemist, Sir Humphry Davy [1, 2]. When Was It Discovered: Its discovery year is 1807 . Salt (sodium chloride) and soda (sodium carbonate) had been known and in use from prehistoric times. Their composition was debated by early chemists that were put to an end by Davy in the Royal Institution of London in October 1807. He exposed caustic soda (sodium hydroxide) to an electric current and obtained sodium metal globules. In the following year, French chemists Louis-Josef Gay-Lussac and Louis-Jacques Thénard obtained the element by heating a mixture of iron filings and caustic soda . As a heat exchanger in nuclear reactors . As a reagent in the chemical industry . Its salts have more uses than the metal itself. Common salt or sodium chloride is added to food to enhance its taste and as a de-icing agent for roads in winter. It also finds application as a feedstock in the chemical industry . Sodium carbonate, another sodium salt, is also known as washing soda and is used as a water softener . Sodium vapor used in streetlights gives off a brilliant yellow light . Na is essential to all living beings as it is vital for the maintenance of different functions of the body. Human beings usually get the required sodium from their food. An average person intakes 10 grams of salt a day though the recommended daily sodium intake (RDA) is just 3 grams. Any extra sodium may be harmful and cause high blood pressure and other ailments . Foods high in sodium are canned fish, meat, entrees, beans, salted nuts, etc. Low sodium foods include frozen lamb, eggs, uncanned dry peas and beans, low sodium peanut butter, etc . The metal is soft enough to be cut with the edge of a coin . The human body contains around 100 grams of sodium . The pure metal is priced at $25 for every 100 gram .